On the Friday, it was a non working day, so I stayed at the guesthouse. I swivelled the desk in my room around so that I could see the pretty garden through my open door. I relaxed my adherence to the dress code by slipping on a long sleeved but close fitting shirt when I sat in the garden to eat. I saw something on CNN about American citizens concerned at a threat to their right to bear arms. I saw a male guest sprawled blissfully on the lawn enjoying the bright sun, and longed for the right to bare arms. When I looked up, the the cloudlessness of the sky made it feel like being at the top of the earth’s atmosphere. Nothing between you and the nearest star. I lay on my bed after breakfast and wiggled my toes, and imagined I was back on that Italian holiday with my husband, and that it felt this hot and gently breezy, but I was wearing only a sarong and feeling the sun and the sand, and him kissing my lips as he came back out of the sea. Then memory became unbearable and I sprang up, got out my laptop and got to work. Lost in budget quarrels and resource puzzles for the next nine hours. Then at about 7pm, there was a very minor earthquake. My chair rose and fell as if it was on the sea. I stopped typing, unsure whether I was just exhausted and losing my balance. The water in my plastic bottle shook and waved about. I quietly put on my headscarf, ready to take some sort of action. I thought, this is ridiculous, I work for a humanitarian NGO and I personally have no idea what to do if there is an earthquake. I can do First Aid, but only if people are lying down calmly on the carpet for me to check for broken bones and bleeds. But nothing more happened. I opened the door and guests and visitors were sitting in the garden, chatting and drinking tea. The earth was not opening up, and I decided to treat myself to a tonic water and some time with my Kindle amid the roses. That evening there was a family party at the hotel. Bored and lonely, and a bit unsettled by the earth tremor, I stalked it – sat at a table where I could see the family members going in, kissing the children, greeting each other on the steps. Some little boys ran around, and played near me and said ‘hi’ very softly, drawn by the cat that was petitioning earnestly for a share in my kebab. Then off they went, clattering about looking for mild mischief. Some of the older men pulled a carpet to a quiet corner of the garden and bowed down for prayers. All sorts of fashions went in. The most glamorous lady wore a black frocked tunic, heavily embellished with silver studs and blue and green embroidery, black skinny pants and a black chiffony embroidered headscarf. Most of the older men wore their shalwar kameez plus waistcoat combo. Some women wore Western shirts over trousers. The little boys wore either mini shalwar kameezes or mini dinner jackets, presumably in line with their parents. I could see they had balloons, and they had live music. Like the Finnish, there seemed to be a preference for mournful tunes despite the happy faces everywhere. My gramdmother always sad that sad songs were more beautiful. I saw briefly a woman unscarfed, thick black glossy hair briefly visible, terribly beautiful. In the curtained windows I could see silhouettes of dancers coming closer and moving further off, like a shadow puppet dance. The next evening, fortunately for my sanity, I went out for dinner with a former colleague whom I had discovered was in Kabul through skype. It was lucky as a combination of long work days and social isolation was wearing down my mental grip on happiness. We went to the exquisite Design Centre Cafe in Kabul. The place, behind a plain metal door in the exterior wall that gives away nothing, was just beautiful. Tapestried armchairs and low tables were set around an open but carpeted courtyard. 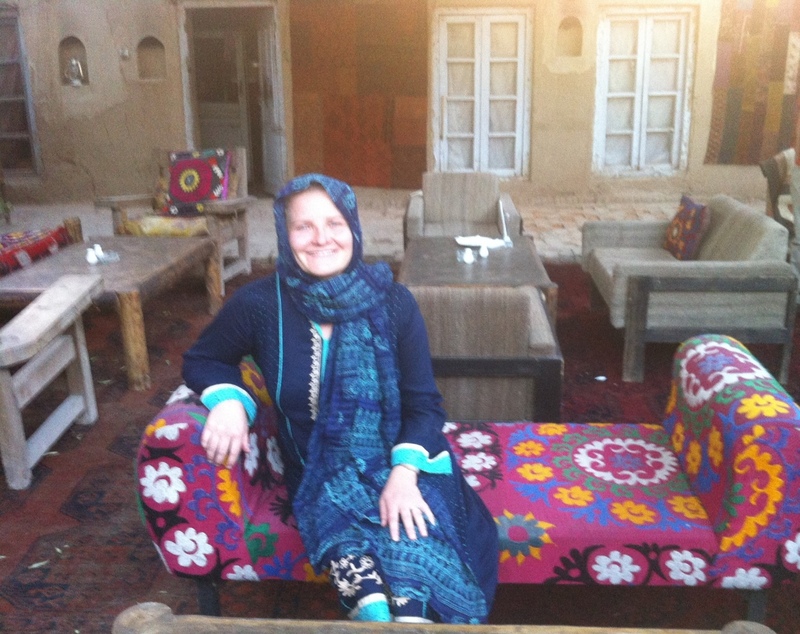 The interiors were gorgeously stylish with old dark wood and candles and embroideries and carpets too, but I always love ‘outside in’ places, and one of the bits about hot climates is being able to live outdoors – so we did, that evening. In one of those weird moments of extraordinary privilege, we went into a room where carpets were being displayed, and met the designer Chuk Palu, who showed us carpets that he sells at Liberty and I could maybe afford one of if I stopped going out for six months. Some of the carpets were woven new but designed old so they already looked like antiques that you might find at the Victoria and Albert. I had been writing about carpet making that morning – it’s one of the few sources of income available to poor girls in Afghanistan, but unfortunately the need to earn money often takes precedence over education – and would it not with me? I wished that I could support this beautiful industry. The carpets made me wish I was richer, and I suddenly had a flash forward that in 10 years time, if we all just supported Afghanistan with development rather than pretending that we might ever be able to meaningfully interfere with its politics, Afghanistan might be the next Lebanon. If we had realised this fifteen years ago, I’m sure the world today would be a better place. It was strange visiting Afghanistan, this country that has come to influence much of what has happened in world politics over the last ten years, and feeling so confined and isolated that I’d had barely more experience of the country than I would have done from reading a good book about it. What else did I see? Kabul is one of those cities overflowing with small scale and big scale entrepreneurs, bumping up against high walls with barbed wire and armed guards. A female politician was shot dead during that weekend, allegedly for not wearing her head scarf – but who knows who she angered and why. But there is huge and widespread support for girls’ education, including from the places where as a Westerner, our media teaches us not to expect it. Day to day, people are friendly. The guards at my hotel were determined that I should be able to say in Dari ‘hello. How are you you? Thank you, I’m fine.’ Weddings and family parties are a huge deal, and joined together by a lived faith and by a value for spending time with loved ones. The food is good. There is world class design behind those bleached yellow Kabul walls. I pray that Kabul and the wider Afghanistan will prosper.